Don Lee Coach & Body Works, 7th Ave. and Bixel St., Los Angeles, California. Jacob William (J.W.) Earl, a former woodworker and lumberjack from Cadillac, Michigan, and his wife, who was originally from California, moved their family to California in 1889 and established the Earl Carriage Works at 1320 S. Main Street, Los Angeles, to build and repair horse-drawn carriages and wagons. Among Earl's first products were simple horse-drawn agricultural wagons used by local Mexican farmers in the "Valley of Smoke" as the Indians called the Los Angeles Basin. Earl soon started making bodies and simple accessories for the automobile and in 1908 he renamed the small shop to the Earl Automobile Works. A few years later the “Valley” changed forever when the Horsley Brothers made their fist motion picture in an abandoned tavern on Sunset Blvd. at Gower St. in 1911. Earl soon discovered that money could be made supplying the movie industry’s pioneers with Roman chariots, stagecoaches, buggies, fringe-topped surreys and other rolling stock for use in their productions. That new industry brought the Earl Automobile Works a new line of work, customizing automobiles for the nouveau riche movie stars and industry executives that now made Hollywood their home. Earl also built some fuselages for the Glen L. Martin Company, an early Los Angeles airplane manufacturer (now Lockheed-Martin). J.W. Earl’s custom-built automobile and truck bodies were well-known for their sculpted appearance and could be seen in numerous film studio’s parking lots during the day and cruising Hollywood Blvd. at night. J.W.’s son, Harley J. Earl (1893-1969), worked in the shop after school and wound up attending Stanford University to study engineering. 6’3” tall Harley was an outstanding athlete who excelled at pole vault, broad jump and shot-put as a member of Stanford’s track & field squad. Much to his father’s chagrin, Harley excelled on another type of track as well. A favorite story of Earl’s friends is the time when Harley’s dad was calmly reading the newspaper with morning coffee. His shiny new Mercer was resting calmly in the driveway, giving no hint of what had happened to it the day before. Turning to the sports page, the senior Earl glanced at an item concerning a week-end stock car race. "Harley Earl, son of the owner of Earl Carriage Works, won the 100-mile race for stock cars here yesterday with a special new Mercer recently purchased by his father". Earl also had a penchant for “test-driving” newly-bodied cars through downtown Los Angeles to test the crowd’s reaction to his father’s latest handiwork. In 1918 Harley dropped out of school and was put in charge of dealing with his dad’s fast-growing custom-body clientele. Earl had a special talent for both schmoozing with and designing exotic bodies for Hollywood’s elite and became friends with many of them; Cecil B. DeMille and Tom Mix were among his closest friends. "Perhaps the most startling local models at the show are those built by the Earl Auto Works, whose sensational Chandler and Marmon are attracting huge crowds. These cars are designed by Harley Earl, a local man who only three years ago, was broad jumping at the University of Southern California, and has sprung into prominence as a maker of motor fashions almost overnight. "The Chandler town car, in blue, is the classiest thing of its kind ever shown on the Coast or any place else. It is surely distinctive, being a low hung creation; so low that a good-sized man can stand along side and look right over the top, yet there is sufficient room inside to keep one from being cramped." The Auto Show had brought Earl Automobile Works to the attention of Don Lee, who bought the company later that year and ab­sorbed it into his pre-existing Don Lee Coach & Body Works. J.W. Earl retained his previous position as shop manager and Harley was appointed chief designer. On July 13, 1919, the San Francisco Chronicle reported that, ". . . [Don Lee has acquired]. . . the largest plant of its kind west of Chicago, and for several years Earl’s has been one of the six largest builders of custom bodies in the United States. J.W. Earl...will continue in active charge, and his son, Harley Earl, will continue as chief designer. "It is Don Lee's intention to turn out the very best coach work obtainable anywhere. With this idea in view, he will send one of his designers to New York twice a year, and as soon as European manufacturers are once more in pro­duction, a Don Lee designer will make a yearly trip abroad… Harley Earl will leave this week for a trip to the Eastern factories to ascertain the trend of the enclosed car styles for the coming fall and winter. Immediately upon his return, construction will be started on several types of the newest enclosed car designs." Don Lee had been selling Cadillacs since 1906 and had become Cadillac's official West Coast distributor at the beginning of 1919. Lee’s dealerships blanketed the state and were in all of its major cities – Fresno, Los Angeles, Oakland, Pasadena, Sacramento and San Francisco. Lee’s major west coast competitors in the early 1920s were Earl C. Anthony’s Packard dealerships and Walter M. Murphy's Lincoln franchise. In the early 1920s the business of supplying coachbuilt bodies to the luxury car trade was lucrative and the Don Lee-Harley Earl partnership prospered. Soon after the takeover, the combined firm employed 90-100 craftsmen and produced some 250 custom cars a year. Harley and Cadillac president, Lawrence P. Fisher would become good friends during this time, as Don Lee Coach and Body Works would do increasingly more business for Cadillac, until in 1925 they fitted 100 customized bodies onto Cadillac chassis. By the mid-twenties Don Lee Coach & Body Works was turning out over 300 bodies a year and Harley Earl was able to boast of wining and dining with the biggest celebrities of the time. Harley would design a car body starting with two dimensional rough-sketch, then turn his favorites into small clay models to show to the client. Up until that time, designer’s sketches were turned into full-size body drafts but were rarely modeled in three dimensions. When a three dimensional model was made, they were typically made from plaster and wood. Clay allows stylists and modelers greater freedom as well as a more malleable modeling process. Earl helped develop and perfect the rules which would govern car design for the next 50 years. Even today, it’s still not known whether Earl sculpted his own early clays or had them made by an assistant. These 3-dimensional presentations plus Earl's splendid sales presentations brought many of Hollywood’s top-list to the Don Lee dealership. Among his famous clients were movie idols; Jack Pickford, Mary Pickford, Douglas Fairbanks, Mabel Normand, Mary Miles Minter, Anne May, Pauline Frederick, Tom Mix, Fatty Arbuckle, film directors; Cecil B. DeMille, Henry Lehrman and even millionaire oilmen such as E.L. Doheny Jr. Even today, Rudolph Valentino, Clark Gable and Gary Cooper are well-known for their love of fine automobiles. At the height of his career (1919), the great comedian Roscoe Conkling "Fatty" Arbuckle was the highest-paid star in Hollywood. He main­tained a small fleet of expensive cars that included a Stevens- Duryea, an Alco, a Rolls-Royce, a White, a MacFarlan, a Renault, a Cadillac and his favorite – a 1919 Pierce-Arrow "66" touring. This was the third automobile designed by Earl for Arbuckle and no expense was spared. 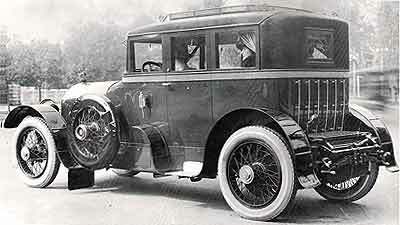 Earl started with a 147 ½-inch, 1919 Pierce-Arrow 66-A-4 chassis which cost $6,000 at the time. 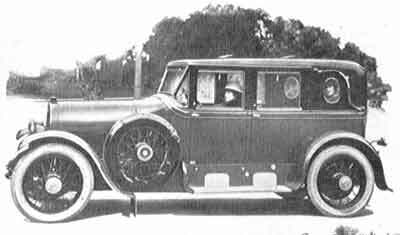 Roscoe then paid $25,000 to Don Lee for the coachwork, a figure that Earl recollects was $28,000. Among the many features of the Arbuckle vehicle is the radiator cap which features a letter "A" with an arrow running through it. Earl employed a number of styling concepts that would appear many years later in his produc­tion designs. Earl reshap­ed the cowl and hood to form a horizon­tal plane from the windshield to the radiator, a flow­ing silhouette seen a full decade later on the 1930 Cadillac V-16. Huge barrel headlamps and Arbuckle’s signature was mounted to the radiator in place of the characteristic Pierce-Arrow frogs-eye lights and logo. 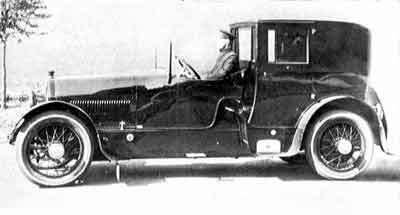 Prohibition started in 1919 and a hidden cabinet located underneath the rear foot rests was undoubtedly built to hide the now-bootleg booze. Arbuckle’s ultimate Pierce-Arrow is preserved today as part of Ken Behring's Blackhawk Collection. Earl was a personal friend of many early movie "greats and used a folding director's chair for many years when sitting with his design-room staff and even wore jodhpurs, the riding pants seen on many a silent movie director. 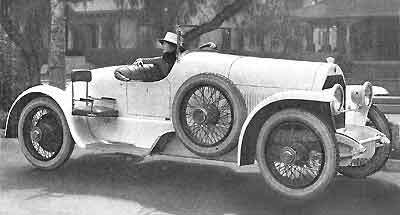 His friend Tom Mix had one custom Earl-designed car that featured a real leather saddle on the roof with painted stars incorporating Mixes’ TM logo all over the vehicle. Another friend of Earl’s, legendary director Cecil B. De Mille, said that both movies and automobiles reflected "the heart of motion and speed, the restless urge toward improvement and expansion, the kinetic energy of a young, vigorous nation." 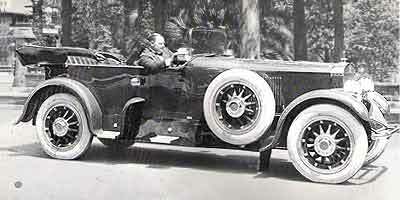 Through the 1920s DeMille owned a number of automobiles equipped with Earl-designed coachwork. His auto entourage included two Locomobiles, a Lincoln, a Cunningham, and an L-29 Cord roadster. Earl was a firm believer in the power of color and a 1926 Autobody magazine article concurred: “Of course, certain cars deserve a dazzling paint job. From October 9 to 16, 1926, the Don Lee Cadillac Company at Seventh and Bixel Streets in Los Angeles presented a gorgeous display of Cadillacs in new and bright colors; it advertised "500 color combinations on 50 body styles. Earl's success with Don Lee’s Cadillacs attracted the attention of Fred Fisher - a golfing buddy of Earls, and patriarch of the famed Fisher Brothers. 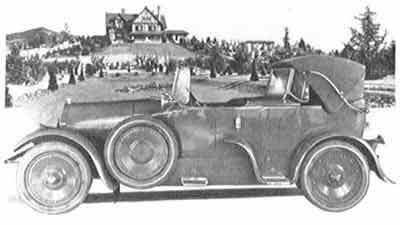 His enthusiasm for Earl's success with luxury cars prompted Cadillac’s president, Larry Fisher, to phone him during the December of 1925 to see if Earl might be interested in designing Cadillac's upcoming companion car, the LaSalle. "You betcha," replied Earl, who temporarily took up residence in Detroit with his wife Sue. 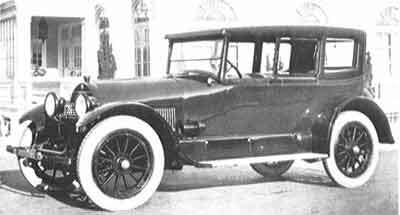 During that initial visit, Earl designed and built four LaSalle clays; a coupe, a roadster, a sedan, and an open touring car. He painted them in black lacquer and showed the Hispano-Suizaesque models to Fisher and Sloan, who approved them for all production. Earl then returned to California and a grateful Don Lee. Nine months later Larry Fisher called again and asked Earl if he might be interested in moving to Detroit permanently to take charge of GM’s new "Art and Colour" department. Much to the chagrin of his employer, Earl agreed, and thus began the Detroit era of America’s most influential automotive designer. Today Don Lee is remembered primarily for the network of radio and television stations that he originally started in 1926. Lee began purchasing radio stations when his main competitor, Earl C. Anthony, purchased one (KFI) in order to advertise his Packard automobile dealerships. The famous Hollywood sign (originally Hollywoodland) is built on Mount Lee, which is named after him. Lee was a true innovator of the airwaves. He bankrolled Los Angeles’ first television broadcast in 1929 and three year later broadcast the first motion picture, The Crooked Circle, to be shown on the tube. His group of stations was originally called the Don Lee Network but by 1929 Lee had aligned himself with broadcasting giant CBS. In the early 1930s Lees left CBS, formed his own Pacific Coast network and aligned himself with the Chicago-based Mutual network. Upon his death in 1934, the company retained his name and his only son Thomas S. Lee (Tommy) handed day-to-day control of Lee’s dealerships and 31 radio stations over to others. However Tommy retained a strong interest in television, and built the first TV studio in Los Angeles on top of Mount Lee, directly above the Hollywood sign. It was from here that the first Rose Parade and many other early television programs, were first broadcast. Although Thomas wasn’t interested in the business side of automobiles, he remained an avid automobilist and had a number of dry-lakes speedsters built for him by Frank Kurtis, whom he met while Kurtis worked for his Dad at Don Lee Coach and Body Works in the 1920s. Tommy maintained a personal fleet of Cadillac V-16s limousines and was an early enthusiast of European sports cars. In the early 1940s Lee was T-boned while driving one and suffered chronic injuries which eventually led to his demise in 1949. The Cadillac businesses were sold following Tommy’s death in 1949 and in 1951, the Don Lee Network was sold by his estate to General Teleradio, the broadcasting arm of the General Tire Company. While the Don Lee logo continued, the spirit was gone, and it disappeared entirely when General Teleradio was merged into RKO Pictures to form RKO General.